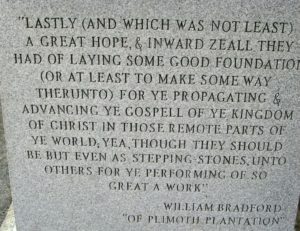 During the journey to America, Winthrop wrote and delivered a lay sermon to the people based on the above Scriptures. Entitled “A Model of Christian Charity,” he envisioned a unified new colony ordained to build “a City upon a Hill” dedicated to God. This famous work originally inspired the idea of American exceptionalism. With an emphasis on individual responsibility, integrity, and group discipline, his writing described how to keep the colony strong in faith and committed to God in the endeavor of creating a holy community. Politicians as diverse as John F. Kennedy, Ronald Reagan, Michael Dukakis, and Sarah Palin have quoted or referred to John Winthrop in speeches. He seemed to know the Massachusetts Bay Colony would be “watched by the world,” and the Puritans would either set an example of righteousness and “find that the God of Israel is among us,” or if they failed to uphold their covenant with God, “we shall be made a story and a by-word through the world” and could incur God’s judgment. 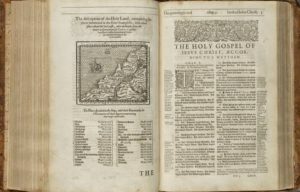 Winthrop’s Bible-inspired writings dominated the development and growth of New England and influenced the government of neighboring colonies. Like Edwards, many dedicated, outspoken men of God wrestled with what they knew from the Holy Scriptures, concerned with the lures and perils of the secular world surrounding them. The enemy uses whatever and whomever he can to distract us and draw us away from God. Speaking to record crowds and traveling the thirteen colonies on a revival tour at that time was the great preacher and orator, George Whitefield, with whom Edwards was somewhat acquainted. Entire chapters and books have been written about these men and others of great faith who impacted Christianity and America. God-fearing, committed men have often been used by the Lord as catalysts of repentance and spiritual regeneration in society. One common characteristic men of God possess is the willingness to give their all for Christ, hoping to store up treasures in heaven. Edwards had asked for a loan from the trustees at Harvard during his short time as president, and Whitefield struggled with debt from orphanages he had started in Georgia and in England. Traveling at a time when sailing was primitive, Whitefield made thirteen trips across the Atlantic Ocean. Many believe the diligence and sacrifice of George Whitefield helped turn two nations back to God. Jonathan Edwards was leading the charge in America while the great John Wesley was preaching up a storm in England. George Whitefield completed this trio of godly men who at that time were primarily responsible for waking up the church and reconciling the lost to Christ on both sides of the Atlantic. He was given strength for what would be his last sermon. The subject was faith and works. Although scarcely able to stand when he first arrived, he preached for two hours to a crowd that no building could have held. Whitefield died the next morning. After these three godly men came Fisher Ames, who was born in 1758. His father died when Fisher was six years old, but his mother was determined to provide her son with a classical education in spite of her limited income. Fisher began to study Latin and when he was twelve years old, he attended Harvard College, graduating in 1774 at the age of sixteen. He went on to become a lawyer, a Founding Father, and the author of the First Amendment of the Constitution. As did most of our founders, he believed the Bible to be the best source of all learning. The spiritual battle for the hearts and minds of young children was already underway! Here is the author of the First Amendment, which includes the free exercise clause protecting public expressions of faith and religion, voicing concerns over 200 years ago. And today in government schools, a Christian can be scolded or disciplined for doing the very things our founders set out to protect – reading, studying, and quoting the Bible. We can look back at those times and ask why religious leaders and the people seemingly failed to heed the warnings. We may also wonder how Ames and others had the commitment and insight to make such admonishments. It is as if they knew the consequences of Christian silence and inactivity would include a culture that has almost completely blotted God out of America. Signs were unmistakable all along that this country was gradually losing the battle for righteousness. United States history indicates that prior to the acceleration of our moral decline, Christians in the 1800s were gaining converts, momentum, and influence. Some consider that century the greatest missionary century in history. Our culture, institutions, laws, and businesses were carried along and led by Christians who, for the most part, were not ashamed to live their faith publicly and discuss spiritual things. All this being done, in sincerity and truth, let us then rest humbly in the hope authorized by the Divine teachings, that the united cry of the Nation will be heard on high, and answered with blessings, no less than the pardon of our national sins. People enjoyed the growing prosperity of a country God had blessed with abundant natural resources. The problem was – and remains today – we cannot serve both God and money. As Jesus said regarding these two masters, for either he will hate the one and love the other, or he will be devoted to one and despise the other (Matthew 6:24). During that time, a young man who would become very influential in America, evangelist Dwight L. Moody, converted to Christianity at a shoe store near Boston where he worked when he was eighteen years old. Moody had grown up very poor, but after moving to Chicago he became successful selling shoes and also started a Sunday school at the local YMCA. Moody’s school quickly grew in attendance to hundreds of students with dozens of volunteers from area churches serving as teachers. The school earned such a good reputation that President Lincoln visited and spoke there on November 25, 1860. Combining preaching with social work, Moody was president of the YMCA in Chicago for four years. During the time of the Civil War, he often visited the battlefront to evangelize the Union troops, traveling as far as Richmond with the army of General Grant. Supported by wealthy businessmen who believed in his ministry, Moody was married, had three children, and invested time in preaching, missions, and social work. When the Great Chicago Fire of 1871 destroyed his church, his home, and the YMCA, all he had left was his Bible and his family. In His sovereignty, God used the fire to refocus Moody’s ministry. Shaken by the losses, he went to New York to seek rebuilding funds, but admittedly his heart was “not in the work of begging.” At that time he described the Holy Spirit overflowing in his life. He felt the strong presence of God leading him to return to Chicago to preach the kingdom of God and devote his life to evangelizing that generation. The next year he was invited to preach in England as calls for crusades began to increase. Charles Spurgeon requested he preach in London in 1875, and when Moody returned home, larger crowds became the norm. On farmland he purchased in Northfield, Massachusetts, where he was born, Moody would later hold conferences attended by prominent preachers and evangelists from around the world. In America, crowds of thousands grew to tens of thousands as Moody became well known. United States President Ulysses S. Grant and some of his cabinet members attended one of Moody’s meetings on January 19, 1876. Several years later, upon meeting pioneer missionary to China, Hudson Taylor, Moody encouraged cross-cultural Christian missions. In 1886, he started his Bible work in Chicago that would later become the Moody Bible Institute. In celebration of the 400th anniversary of Columbus discovering America, Chicago hosted the 1893 World Fair, an event that ran for six months. Moody preached the gospel to thousands of people each night, and he established locations all over Chicago for evangelistic services. With the help of visiting pastors and evangelists, Moody introduced multitudes to the Christian faith during that time. He also initiated the follow-up of converts, called an “after-meeting,” to help counsel people who responded to the “altar” invitation. Dwight Lyman Moody died six years later on December 22, 1899. Some of his final words were: “Earth is receding, Heaven is approaching! God is calling me!” Moody is said to have preached the gospel of Jesus Christ to over 100 million people worldwide. Around the time Moody died, another Chicago-area evangelist was becoming popular. William Ashley “Billy” Sunday got saved while playing in baseball’s National League during the 1880s and left baseball to preach the gospel. The Pittsburgh Pirates offered Sunday $2,000/month; Evangelist J. Wilbur Chapman hired him for $40/week. Sunday was an evangelist from 1893 to 1935, and one of his unique traits was his plain, straight-forward preaching. As the clergy of his day tried to impress folks with education, intellect, and vocabulary, Billy Sunday was known for his fire and simplicity. He often spoke about other preachers who were concerned about offending people with the truth about hell. He not only told unbelievers to get saved, he also preached against churches that were filled with unsaved members and those who became apathetic about the lost. In hindsight, it’s easy for us to say Billy Sunday [and others] was right. Despite the crusades, revivals, and conversions, society seemed to maintain its path toward ungodliness to the point of infecting the church in America along the way. If Christians did not awaken to this reality, which they didn’t, many would soon become disinterested or apathetic. It is indisputable men of God established this nation on biblical truth as they pursued freedom from religious persecution and “the advancement of the Christian Faith,” as William Bradford stated. But since our foundations are eroding, perhaps persecution is exactly what needs to happen in order to shake us up and bring us back to God. This is chapter 1 from The Cost of Our Silence. To read the full Introduction to the book, click here. One Response to What’s Happening To Our Heritage? Great work keep it up!!!!! !